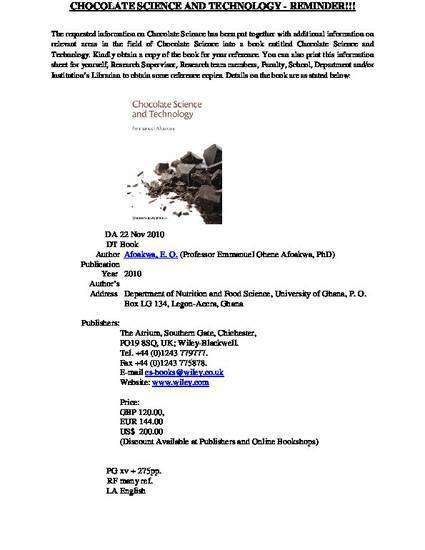 Cocoa and chocolate consumption – Are there aphrodisiac and other benefits for human health? Cocoa and chocolate have been acclaimed for several years for their possible medicinal and health benefits. It is only recently, however, that some of these claims have been more clearly identified and studied. Recent epidemiological and clinical studies, for example, have shown that dietary supplementation with flavonoid-rich cocoa and chocolate may exert a protective effect on low-density lipoprotein (LDL) oxidation, which has been associated with a reduced risk of developing atherosclerosis. Some of the identified benefits of flavonoid-rich cocoa and chocolate include antioxidant properties, reduced blood pressure via the induction of nitric-oxide (NO)-dependent vasodilation in men, improved endothelial function, increased insulin sensitivity, decreased platelet activation and function, as well as modulated immune function and inflammation. Furthermore, chocolate has been reported to release phenylethylamine and serotonin into the human system, producing some aphrodisiac and mood-lifting effects. Since these claims could have implications for the consumption levels of cocoa and chocolate products on the global market, understanding the critical factors involved and their potential benefits are currently thought to be of great importance to consumers.